I’m busy with a new book (and maybe a revised edition of an old one), writing for Sky & Telescope with some regularity, and don’t have a lot of time for the old blog right now. However, I couldn’t let Christmas pass without at least a short post. What’s been going on here astronomy-wise? Clouds, that’s what. But in the days leading up to THE BIG DAY, I did get a few nights good enough to warrant dragging my 10-inch Dobbie, Zelda, into the backyard. Admittedly, she hasn’t been used much in the last year, and I was curious to see what I thought about her three-and-a-half years down the line. Why did Zelda, a basic solid-tube Zhumell (GSO made) Dobsonian, come to stay with me in 2015 (can it really have been that long)? Mostly to replace my hallowed truss tube reflector, Old Betsy, who was destined to go to a new owner in the winter of that year. Betsy had become too much for me to handle thanks to a back injury I’d sustained. One afternoon, out of curiosity, I booted up her computer, a Sky Commander DSC rig, and the last date in it indicated she hadn’t been used in well over a year and a half. So, Betsy had to go, but I still wanted a little aperture for the visual deep sky, and set about hunting for something more suited to my new realities (which in addition to my reduced ability to lift heavy telescopes included a fairly decent backyard for routine observing). I had an 8-inch Dob, but that just wasn’t enough for some of my backyard observing. Obviously 12-inches (and up) was too much. That left a 10-inch aperture solid tube Dobsonian. Why a solid tube? In apertures under 12-inches, I find one to be easier to lug around than a truss tube job. It's a pain to have to disassemble a truss tube's tube. Even if you can leave it in one piece, it's still easier (for me) to manage a solid tube in the process of getting it out into the yard. Anyhow, after I settled on a 10-inch Dob, a solid tube Dob, the questions became: “What sort of solid tube Dobsonian and from whom?” The first question was easy to answer. I didn’t think I’d be chasing Herschel 2500, PGC, and UGC galaxies from my back 40. I’d be after the relatively bright stuff. Stuff I could locate with fair ease even in my compromised skies with a 50mm RACI (right angle/correct image) finder and a zero power Rigel Quick Finder site. No goto or even digital setting circles required. That left the question of where to buy. Which was a little more difficult. Orion, of course, was (and is) a big player in the solid tube Dobsonian game. They had some nice ones back in 2015; especially their goto/tracking models. As above, though, I didn’t want goto and tracking. Their standard (from Synta) Dobs were a little more expensive than the competition, and didn’t offer the features of the other widely available (at the time) brand, GSO. Since I preferred GSO, that also eliminated the Syntas Synta sells themselves under their SkyWatcher brand. The GSO Dobs, which are still available (sometimes even from Orion) had some features I really liked. While not everybody agrees, I loved the smooth, easy Lazy Susan bearing on the azimuth axis. The knobs that adjust altitude tension were far better, I thought, than the silly spring tension system the Syntas from SkyWatcher and Orion had. 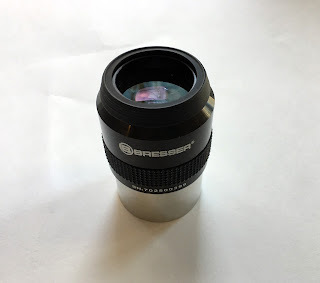 Another huge factor was the GSO accessory lineup: an excellent 2-inch two-speed Crayford focuser, a 50mm RACI finder, a pair of eyepieces including a decent 2-inch 30mm wide-field, an eyepiece rack, a cooling fan for the OTA, and a laser collimator. OK, ya’ll…I’ll fess up. The biggest selling point for your penny-pinching old Uncle Rod? In mid-2015 you could get a 10-inch shipped to you for less than 500 bucks (yes). That was made possible by a big and now gone scope retailer, telescopes.com (Orion now owns that domain name), a subsidiary of the enormous Hayneedle operation. Not only did the 10-inch Zhumell-branded GSO go for a great price, they had it on my front porch in two days. From the time Zelda arrived, she was a comfortable scope for me. She remains set up in the sun room. When it’s time to observe, I separate OTA from base—the OTA will stand safely on its own vertically—get the mount into the backyard with the aid of a nice carrying handle, return for the OTA, carry it across the deck and down three steps, and I am done. There’s also the fact that I can leave the telescope set up in my secure backyard for days at a time if I get a good, clear stretch. All I have to do to begin observing is remove her Telegizmos cover. It doesn’t do much good to be able to get a telescope into the backyard in a hurry if it takes a long time to acclimate to outdoor temperatures so it can deliver its best images. The built-in battery-powered cooling fan turned out to be less of a mere gimmick than I thought it would. It really helps get the telescope acclimatized and ready to observe in as short a time as possible. I generally run the fan the entire time I’m observing, and have never noticed any sort of vibration even at high power. Such were my thoughts on this year’s Christmas Eve as I waited for dark. Zelda had been set up for three days while I used her to test a product for an upcoming Sky & Telescope Test Report. That was done. 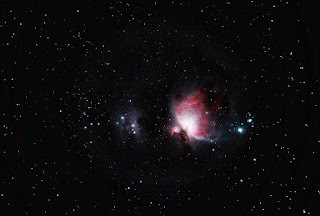 Tonight, it would be strictly fun observing including my traditional Christmas Eve look at M42. Alas, it would be about an hour before the Great Nebula was well placed for observing. What could I look at till then? How about the little comet that’s caught everybody’s attention, C46/P Wirtanen? The visitor is currently passing through Auriga, and while the constellation wasn’t very high up—it was just above the roof of the house—I couldn’t wait for it to get much higher. A full Moon would shortly be on the rise, and would no doubt extinguish the comet. 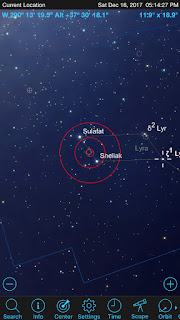 A quick look at my fave astronomy/planetarium program, Stellarium, showed me where the sprite lay: just north of and midway along a line drawn between Capella and Menkalian (Beta Aurigae). I began hunting around with a 27mm ocular, but kept coming up empty. Hmm. The sky was bright to the east where the Charioteer was hovering. That is, in fact, the most light-polluted area of my sky. How do you deal with a bright sky background? One way is by increasing magnification, spreading out the sky glow. In went my vaunted Happy Hand Grenade, a 16mm 100-degree eyepiece once sold by TMB, Zhumell, and others. A little slewing and a little staring soon turned up a something. Which eventually morphed, as I concentrated and used averted vision, into a little more than that. There didn’t seem to be a star-like nucleus, but there was a subtle central concentration and brightening. The coma wasn’t round; it was distinctly oval. I almost convinced myself I could see a hint of a tail. After admiring the comet—such as it was—for a fair amount of time, it was time for target two. What’s one of the best objects for urban and suburban observers other than open clusters? Small and medium-sized planetary nebulae. Riding high was one I hadn’t visited in quite some time, NGC 7662, the Blue Snowball. At magnitude 8.5 and a size of 37”, the Snowball is just about perfect for a suburban sky watcher. Certainly, it was not a challenge for Zelda. Well, not after I found it, anyway. While NGC 7662 was good and high, in my somewhat hazy skies its area was somewhat star-poor. Nevertheless, after consulting Stellarium, the object was in the field of the Happy Hand Grenade in short order. At 78x, NGC 7662 looks a lot Jupiter shining through clouds. A large, slightly oval, slightly dim, slightly soft-edged disk. And that is about it—well, other than that, as its name suggests, the nebula is slightly (very slightly on this night) blue-tinged. Is the above all there is to see of the Blue Snowball? Not quite. Inserting my 4.7mm 82-degree Explore Scientific eyepiece and adding an OIII filter to that brought out subtle hints of detail. It was clear the nebula isn’t just the bright and featureless disk it appears to be at low powers. At high power, it shows subtle darker and brighter patches near its center, hints of the inner ring visible in long exposure images. What else did I notice on this night? How good Zelda’s primary mirror is. Say what you will; the Chinese telescope factories have their game down. Their optics are almost universally good and consistent, and have allowed many of us to own telescopes better than we ever thought we would. Blue Snowball essayed, it was M42 time. I was not to be skunked this Christmas Eve as I had been the last couple of years, but it was a pretty near thing. High clouds were beginning to roll across the sky in advance of a front that will trouble us over the next week or so. For now, however, the sky was holding and I was granted my first good look at the nebula this year. How was it? The haze was undeniable, but there was still so much to see. Not just the huge “wings” of nebulosity, but the fascinating stars of the Trapezium and the many other tiny and brilliant suns scattered across the cloud. Soon, I wasn’t just seeing the nebula with my eyes, but with my mind. I began recalling views of Christmases past stretching all the way back to Christmas vacation 1966 and my first look at this incredible wonder. I haven’t seen the nebula every Christmas Eve. Sometimes clouds have intervened, and sometimes other things have kept my eye from a telescope, but to me it will always be the ornament of ornaments. Nebula admired, and memories reviewed, it was time to ring down the curtain on this observing run and another Christmas Eve. I covered the scope, and was soon inside, relaxing with the cats and wondering whether I needed to watch It’s a Wonderful Life one more time. “It was always said of him [Scrooge], that he knew how to keep Christmas well, if any man alive possessed the knowledge. May that be truly said of us, and all of us! And so, as Tiny Tim observed, God bless Us, Every One!" If you’ve been reading these little epistles for a while, you know I one of my uses for planetarium software—programs that create a graphic representation of the sky on your desktop—is to send my goto telescope mounts on their gotos. When I am imaging, anyway. It’s nice to be able to sit at the laptop with the camera control software running and send the scope to its next target with a mouse-click. No getting up and walking out to the scope (which is set up in the yard while I operate from the deck) to fool with the hand controller. But I do have another use for planetariums, one that’s just as important. My other use for Cartes du Ciel, Stellarium, and the rest is for quick reference. I want to know what’s going be up at 8 p.m. Or I’m writing a magazine article and need to find out where faint fuzzy number one is located in regard to faint fuzzy number two. Sometimes I need the objects’s basic statistics: the spectral type of a particular star, the magnitude of a cluster, the Hubble type of a galaxy; you get the picture. For most of my indoor use, I do not need a soft with ten zillion stars and galaxies in its database. I need a program that is, most of all, quick to launch. If a soft takes more than 15 – 20 seconds to start, I become annoyed. I just wanna see when Orion’s gonna be up good and high, and I don't want to wait all freaking day to find out. So what do I use? Let’s turn the clock back, way back (well, relatively speaking) to the early 1990s. The first truly useful astronomy program I encountered is still one of the best for quick reference—or would be if you could get the DOS based SkyGlobe 3.6 to run on a post-Windows XP machine. Skyglobe was, above all, fast, blazingly fast, to load even on my old 486 (don’t ask, kids). I was still using it when my Toshiba satellite running XP finally gave up the ghost. After that? I foundered and floundered for a while. Cartes du Ciel is a wonderful program. It’s free, but nevertheless is still one of the greatest astro-softs to ever to be published. Problems with it? While it’s its GUI has gotten a little fancier over the years, it’s still pretty old fashioned in that regard. And the graphics, its depiction of the sky, are old school for sure. More Skyglobe than TheSky X. That last is not a huge problem for my use, but I still like a pretty display, I must admit. CdC is certainly quick to load, too, if not Skyglobe fast. In about 15 seconds max it is ready to roll on my middle of the road desktop. I was happy with CdC for a long time. It was basically all I used day in and day out for everything, including for indoor reference, sending my Celestron mounts on gotos, and serving as a front end for EQMOD. I doubt I'll ever stop using Cartes. It simply does some things no other freeware soft does. Just because CdC is a good thing, however, that doesn't mean it is the only thing. Alas, there’s this thing called “feature creep.” Stellarium has grown up, and, like a lot of us, in middle age it’s grown out, too. It has put on a few pounds virtually speaking. Even if I don’t turn on much of its extensive (and amazing) feature set, the current release has me tapping my fingers as it loads up—it now takes as long as 30-seconds (like many programs, it’s faster if you’ve recently run it). That may not sound long for you, but it's an eternity for your impatient Uncle Rod when he’s got a hot observing idea or an inspiration as to a target to add to an observing article. Then, I happened to read a post on everybody’s fave astro-BBS, Cloudy Nights. A post about a program I hadn’t heard about in a long time, KStars. If you, like me, once fooled around with Linux, even for a little while, the program's name is probably familiar. It was one of the (few) serious astronomy apps for that operating system when I was going through my Linux phase. Reading the post on CN, I was surprised to learn the program is not only still around, it is still being developed. There is now a version for, believe it or not, Windows 10. Huh! From running it on Linux (under the K desktop, natch) I remembered it as small and fast and thought I’d give the Win version a try. Installing KStars is simplicity itself; simply download it (here), and double click the install file when Windows (or Linux or OSX) finishes. Installation is automatic with no unzipping or anything like that required. Installation complete, I clicked on the program’s icon (which I had to send to the desktop manually; it wasn’t placed there automatically) and got out my stopwatch. In less than 10-seconds the program was up and prompting me to begin set up. Which was also painless. About all KStars needed to know from me was my location. You can enter latitude and longitude manually, or just click on a city from KStars long list. After that, all that remains is the additional files window. Like most modern programs, KStar offers an extensive set of supplemental object catalogs and image files. You can have millions of stars and deep sky objects if you wish. Me? I didn’t wish. In the interest of keeping the program small and quick, I only downloaded one additional item, thumbnail type images of the NGC objects for display in the information window that can be displayed for deep sky objects. If you should change your mind about additional files, it’s easy to run the installation wizard again later and add or remove files as desired. What was my first impression of KStars? “Pretty enough. The display ain’t as attractive as Stellarium’s but looks more modern than that of Cartes du Ciel.” Experimentally clicking and dragging the sky around to change my view yielded good results. 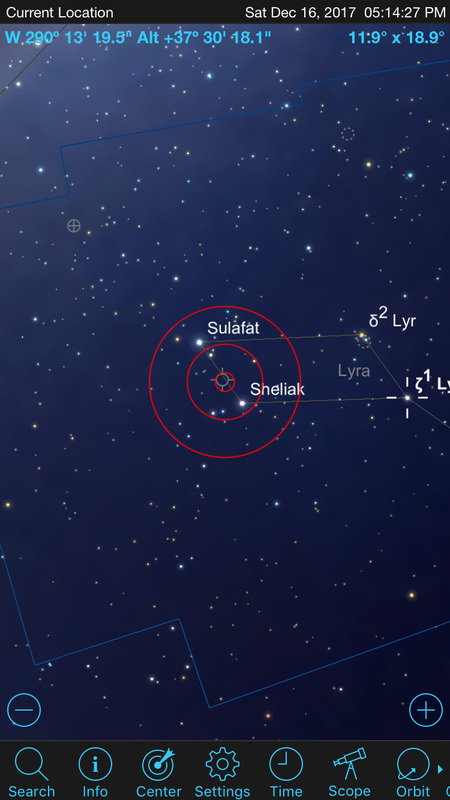 It was every bit as smooth as this function is in Stellarium. 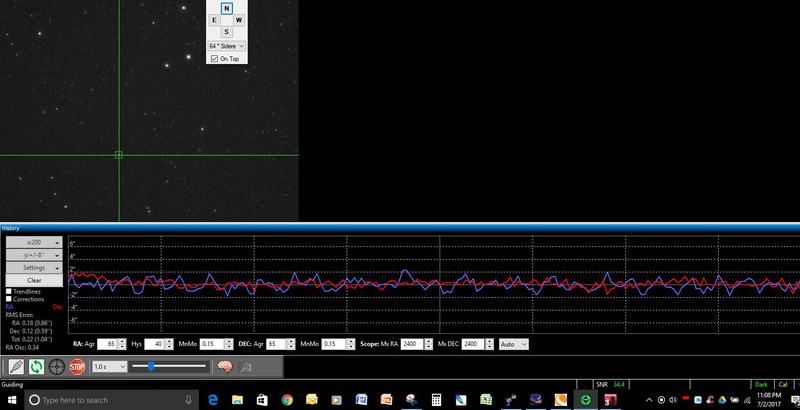 I did note dimmer stars and DSOs are erased during a drag—presumably to speed things up (Stellarium doesn’t do that). Like other planetarium programs, the next step is to turn on/off features you want or don’t want. With KStars, that mostly involved turning on the constellation lines and setting up labels and their densities (numbers) for constellations, stars, and deep sky objects. When I had the program looking he way I like, I did a little playing around to get the lay of the land. First thing, I picked a DSO, good, old M81, and clicked on it. I wanted to see what sort of data KStars would yield about targets. To do that, right click on an object and select “details” from the menu that appears. What I got is shown above, which is not much. The galaxy’s Hubble type isn’t even given. All there is is magnitude, position, size, and alternate designations. That’s the bad. The good is that clicking the "links" and “advanced” tabs brings up hyperlinks to web pages concerning the object, and to resources like NED, the NASA Extragalactic database. Unfortunately, I was disappointed to find that many of the web page hyperlinks in the details window are dead links. Moreover, even if the URLs all worked, I would like a little more info on objects in the program itself. Both Stellarium and Cartes du Ciel do much better here. One of the things I do most frequently when writing about deep sky objects, is, as previously mentioned, describe their positions in terms of their distance from another object in angular degrees and position angle with regard to that other object, “M78 is 2-degrees 30’ northeast of Alnitak.” Alas, while you can engage an angular separation mode that measures the separation of two objects when you draw a line between the two with the mouse, KStars only gives separation, not position angle as well like most other programs do. At first, I thought that was it for KStars. Knowing both separation and position angle is important for me. Then, I discovered KStars’ astronomical calculator. One of the many functions it performs is determining the separation and angle of two objects. It’s easy to select objects from a list, and a push of a button then gives both angular distance and position angle. Frankly, I found this easier (and more precise) than using a mouse. Otherwise, what’s the program like? Oh, it’s fairly basic stuff. It has some built-in pictures for the more prominent objects displayed on the charts. Various reticles (like a Telrad) can be overlaid on the maps. A red night vision mode can be engaged. 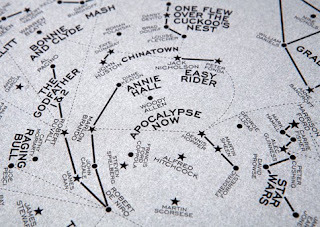 Unlike Stellarium, you can print charts (if not very good looking ones). There’s even telescope control. Alas, that’s via INDI, not ASCOM. I don’t know that I’ll fooling around with that, but I don’t really intend to use KStars on the observing field, anyway. So, to sum up? It’s a useable program for just about anything. Is there a reason or reasons to use KStars instead of the big two freeware planetariums? Yes. If you, like me, need fast. Or you need small. Or maybe hardware constraints dictate you need both, you could do worse. Much as I miss good old Skyglobe, I must admit humble KStars just blows its doors off. And that's good. But. Will I use it? How much will I use it. That remains to be seen. I like KStars, but I’ll admit it’s gonna be hard to make myself stop using those old reliables CdC and Stellarium. Stay tuned. Issue #551: Merry Christmas Eve from the Astroblog! Well, it wasn’t quite a white Christmas on the Gulf Coast, but, as you can see from the picture at left, taken a couple of weeks previously, we came close. Closer than in years, and years, and years. Maybe since the 1950s. 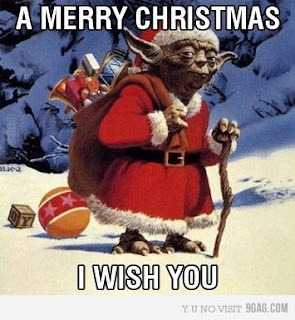 Anyway, what is Christmas without the Christmas Eve edition of the little old blog from Chaos Manor South? That has taken several forms over the eleven years we’ve been on the air here (hard to believe it’s been eleven freakin’ annums, true believers). Sometimes it’s been an epistle to Christmas Eve and its ghosts. Sometimes it’s been memories from my Christmases Long Past. Once in a while it’s been a short and sweet “Merry Christmas Everybody and Goodnight!” I thought this time might be a little different. Perhaps a recap of my astronomical year, something I’ve normally reserved for New Year’s. Before we get to that, “MERRY CHRISTMAS CHARLIE BROWN!” And a wonderful night before Christmas, too. This one looks to be calm and uneventful here. Just me and the cats watching Netflix. Naturally, I put a telescope in the backyard, my 3-inch f/11 achromatic refractor, in hopes of getting my traditional Christmas Eve view of that most beautiful and numinous of all ornaments, M42. Shall we step out into the cold and have a look?.. However, on this deep night the subject is 2017, not 2018. The year began with the end of my series on observing the Messier objects as we signed off with Messiers 107, 108, 109, and 110. Most of you seemed to enjoy the voyage through the Ms, which had been going on for most of 2016, but my title for this installment, “This is the End, My Friends” did upset a few of my faithful readers. Given some of the changes I’d gone through over the previous two years, which I’d occasionally shared with you here, and my slowly decreasing output of blog articles, you were to be forgiven for thinking the title meant we were done, that the blog was finis. Not so—there weren’t to be quite as many updates in 2017 as in the past, but I still kept moving forward in my bumbling fashion. As the cold months wore on and the skies grew ever cloudier, I turned to a new series, “The Novice Files.” The entries covered the basics of the sky globe, things like R.A. and declination, star and object names, object catalogs, etc. etc. Things that are familiar and obvious to most of us but puzzling for Joe and Jane Novice. That was in part so I’d have something to write about. I sure wasn’t going to be doing many observing articles unless I could glom onto an x-ray telescope. I didn’t just do these articles to have fodder for the blog, though. I thought the subjects covered were pretty darned important for the newbies amongst us. January also found me blogging about the latest and quite major update to the Stellarium program, which is literally the only planetarium software I use these days (other than the also great Cartes du Ciel occasionally). Yes, Stellarium is free, but it’s also so good, so pretty, so easy to use, and has so many wonderful features that the heavy hitters of commercial software, TheSky, Starry Night, and all the rest, sit unused on my hard drive. Couple Stellarium with the ASCOM scope control add-on, StellariumScope, and I am sitting in high cotton and don’t want for more. As February came in and the sky began to get a little clearer, I found I needed some images for my magazine work and drug out my trusty Celestron Advanced VX mount. Why the VX? Why not my EQ6 or CGEM? The AVX had one big advantage: light weight. As you know if you’re a faithful reader, I injured my back in 2015 while washing the porch of our old Garden District Victorian home, and have suffered recurrent bouts of pain. Bad enough that the last thing I want to do is aggravate my back. Light weight is good, but as I recounted in the blog entry, the VX is also surprisingly capable. With the telescopes I normally use for deep sky imaging in these latter days, f/7 5-inch and 80mm APO refractors, it works very well indeed, always delivering round stars. The VX has some cool modern features, too, like auto-alignment with Celestron’s Star Sense accessory. I’ve always hated polar alignment, so when I found a way to polar align more easily and accurately than ever before using the Sharpcap software, my guide camera, and my guide scope, I just had to share that with you in “A New Way to Polar Align.” There is no doubt in my mind that the better polar alignment possible with Sharpcap is one of the things responsible for me being able to kick my astrophotography results up a notch. Despite the time I was spending in that backyard—or maybe because of it—I found I had to bite the bullet and slow the blog down. In “Is This the End?” I broke the news to my faithful cadre of Sunday Morning aficionados that I just couldn’t keep up the weekly publication schedule I’d maintained for years. I hoped, I said, that I could eventually begin to get new articles out the door every week again, but cautioned that “once a month” was more likely—which has turned out to be accurate. Looking over my output for late spring and summer, I’m actually amazed I published as often as I did. The weather down here was frightful. It was as cloudy as it has been in a long time, and that’s saying something given the nasty weather cycle we’ve been in for the last five years or so. Despite Stormy Weather, I pressed on through a tropical summer. 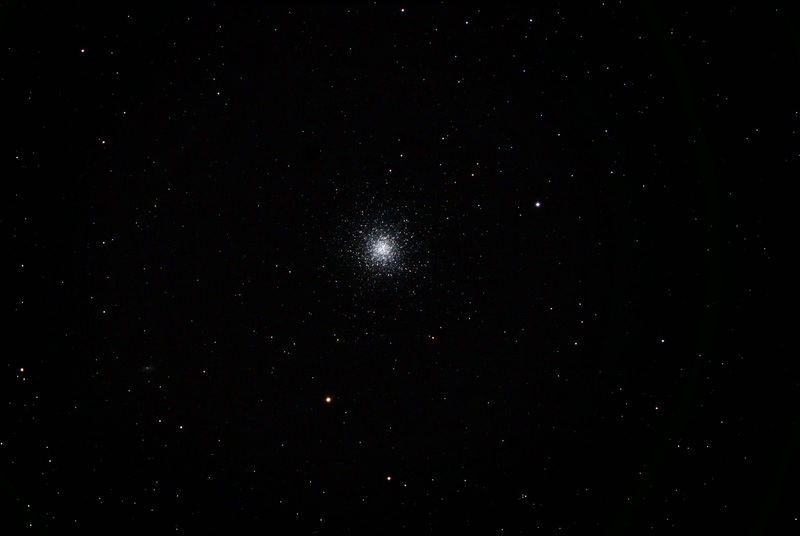 I even managed to get my traditional yearly image of M13 in July. From my backyard—I’ve grown weary of lugging a ton of gear out to my dark site. Despite the scudding clouds of a muggy night, one on which I felt like was observing from underwater, I was still able to bring home My Yearly M13 with my SkyWatcher 120mm APO and the reliable and dependable AVX. Despite raindrops and mosquitoes, July actually turned out to be a good month for the blog, with several entries appearing. It seemed that with the pressure to publish turned off, I was having more fun writing the Astroblog than I’d had in a long while. One of my favorite articles from this time was “To PEC or not to PEC?” wherein I not just explained the Periodic Error Correction feature of modern telescope mounts, but programmed PPEC into my VX, bringing its RMS error down to a very respectable (for a sub 1000-dollar GEM) 1” RMS or so. The next July entry, “Good, Old EQ6” was an epistle to my much-loved Atlas GEM mount, which I’d owned for ten years by this time. It was also a goodbye to it. Unfortunately, back problems meant the handwriting was most assuredly on the wall for the EQ6—it was too heavy for me to lift safely anymore, and I’d just have to get rid of it. The article came from my backyard checkout of the mount prior to selling it. The Atlas performed so well that I almost decided not to let it go after all. Until I was removing the mount from the tripod and almost aggravated my back, wouldn’t you know it? 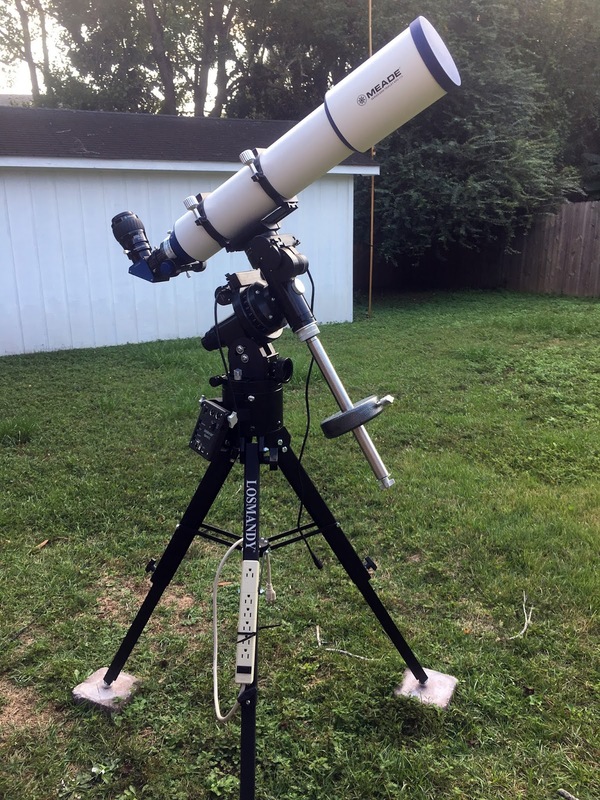 The final July article was in the same vein, and concerned my disposing of some more beloved gear beginning with my Celestron CGEM. The mount had been a great performer for me—don’t believe everything you read on Cloudy Nights—but, like the Atlas, it was just too freaking heavy and I had to sell it too. Which I did. Perhaps even more sadly, I let go of my C11 for the same reason. If there’s an SCT I’ve loved best over the years, it’s probably Big Bertha, my NexStar 11 GPS. However, I decided leaving the OTA sitting in her case month and month after month wasn’t doing either of us any good. So it was that with a heavy heart I determined that the C11 would follow the CGEM and Atlas. The summer weather was awfully punk, and the fall was most assuredly no better. Thanks mostly to that weather, I didn’t get to put in a lot of hours with the Losmandy. But what little I was able to do with this very pretty mount impressed me. 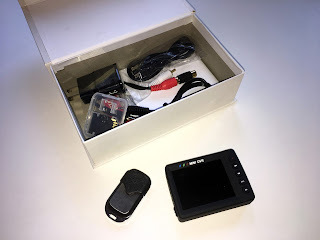 I especially loved the full-color touch screen Gemini 2 hand control and the mount’s Ethernet connectivity. September and October only featured a single entry apiece. One concerned the experience of using the GM811 for visual observing, and the other my (semi) return to video observing—prompted by the arrival of a wonderful box of video goodies from the legendary Orange County Telescope. …and so, Christmas approaches, me stirring from my semi-doze on the couch only long enough to click Netflix’s accursed “Are You Still Watching?” button. What more is left to say? Only “Have a great holiday, God bless us everyone, and here’s to a wonderful 2018”—old glass half full me (on my good days) has decided it IS gonna be a good one. 2017 wasn’t a very active year for me in astronomy. The freaking weather, if nothing else, saw to that. The Deep South Spring Scrimmage, for example, one of two star parties I still attend each year without fail, was clearly in for a rain-out and I didn’t even bother to register. That event’s fall edition, the just-finished Deep South Star Gaze, yielded only one good night out of the four I signed up for. Sigh. But that doesn’t mean I didn’t do any telescoping. What I did do this year was mostly imaging from the backyard. That can be fun, but I have to admit the actual picture-taking part of it just ain’t that engaging. After set up is done and the mount is guiding and the camera exposing, my astrophotography consists of me sitting inside watching TV while telescope and computer do their thing on their own. As fall segued into winter, however, the skies improved (somewhat), and I found myself in a nice clear pre-Christmas stretch. What to do? I was tired of worrying about cameras and computers for the moment. I was longing for some of that old one-on-one relationship with the cosmos that’s what got me interested in this crazy game in the first place. 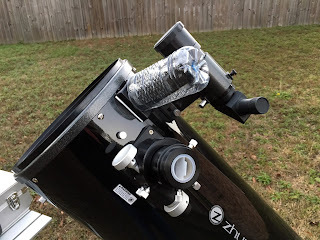 To that end, what went into the backyard the other night was my consummately visual scope, Zelda, a 10-inch GSO solid tube Dobsonian reflector who came to stay with me a couple of years ago. There are no computers involved with Miss Z. The closest things she has to electronics are her primary mirror cooling fan and her illuminated zero power aiming device, a Rigel Quick Finder. Also into the backyard went the folding aluminum camp table I use as an observing table, and my case of favored eyepieces. Setup took all of five minutes and I was done. Well, I was nearly done, except for star charts. As I tell my undergraduate astronomy students, “You can’t find the stars’ homes without a map!” Did I say “no computers”? I did, but only ON the telescope. My Android tablet running Sky Safari Pro went on the observing table next to the eyepiece box. I could have used one of my print sky atlases, like Sky & Telescope’s Pocket Sky Atlas (or the new Jumbo edition, which I love). And I often do that when the yen for simple visual astronomy takes me. But you know what? In some ways, Sky Safari is simpler to use in the field than a book. Want to find some object? No paging through an atlas, no trying to remember exactly which constellation NGC umptysquat lies in. Just click a little magnifying glass icon, type the DSO's name/designation, and the target will soon be centered on the screen under a Telrad reticle. Given my (somewhat) aging eyes, I also find SkySafari’s screen more legible than the pages of a book illuminated by a dim red LED flashlight. On a recent cold (for me) Tuesday evening, the TV was showing nothing but reruns—when did the rascals come up with this "mid-season hiatus" nonsense? That was OK. In the backyard, the curtain was rising on the great sky show. I was excited at that prospect. Maybe more excited than I’d been about astronomy all year. Excited, yes, but also unsure, as in being unsure exactly what to look at. While I am a big proponent of observing lists—usually if you go out to observe without one you won’t see much of anything at all—I hadn’t made one this time. Lazy? Maybe a little. Just wanting to recreate those spontaneous nights under the stars I experienced as a youngun? Perhaps that too. But I still needed some idea where to point Zelda after I’d had a nice, long look at the sinking Ring Nebula, M57. I clicked the search icon, and, sure enough, there were those lists displayed before me. Including, thank goodness, “Tonight’s best.” I began running through ‘em starting with the wonderful starball that is M15. When I applied 200x to it in the somewhat hazy (and growing hazier) sky, the Pegasus globular broke into a horde of minute suns. And so it went till my feet began to grow cold and the haze began to devolve into clouds some time later. I had plenty of fun. But I also had some epiphanies. “Rules” if you will, for observing the deep sky under suburban backyard skies. 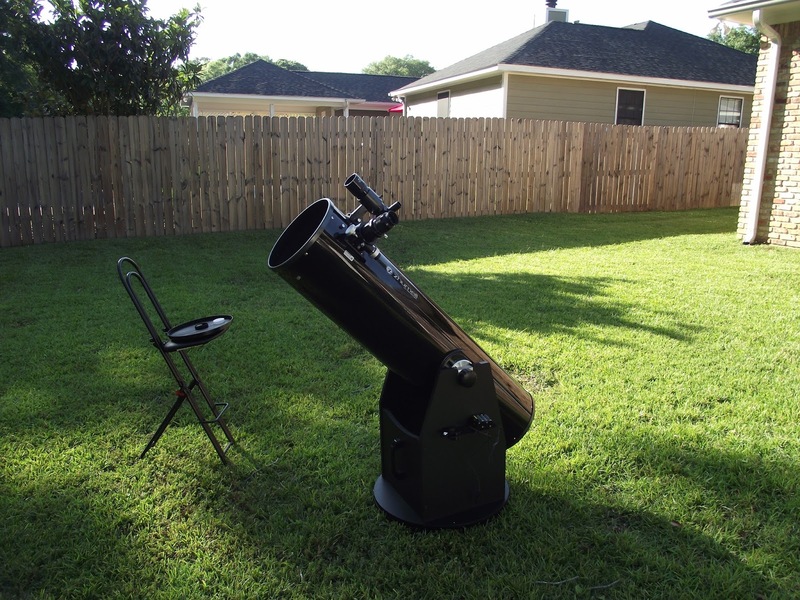 Telescope: OK, so you wanna do some casual backyard visual observing, do you? Which scope? If you only have one, naturally that’s it. If you have a stable like some of us do, however, which one to use? 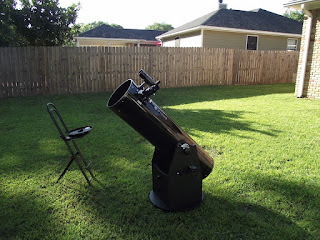 There is something to be said for a small telescope, especially a refractor, for casual backyard use. Especially for spur of the moment observing. I can have my 3-inch f/11 achromat or even my 4-inch f/10 achromat in the backyard and ready to rock in minutes. Since there is basically no cooldown required, I can have a quick look at M13 and be back inside for more Gotham after the commercial ends. Casual observing, looking at the showpieces in an off-the-cuff sort of way, is great. But what if you want more? I, for example, have been thinking about running through the 600 objects in Orion’s (great) Deepmap 600 list. Some of these objects—in fact a of lot them—are a challenge for a small suburban refractor. At this point it's time to kick the aperture up a couple of notches. What is the optimum aperture in the backyard for me for deeper deep sky observing? I’ve found that to be 10-inches. The horsepower gain over a three or four inch (or even an 8-inch) is considerable—don’t believe the old urban legend that says that more aperture doesn’t help in a light polluted suburban sky. A 10-inch solid tube (especially) Dobsonian is also very portable, if not in grab ‘n go fashion. Equatorial or alt-azimuth mount? Either is fine with me, but my backyard observing does tend to be of a more casual nature than what I do at dark sites, and I usually don’t want to spend a lot of time fooling with a goto GEM. With a decent Dobsonian I don't miss tracking motors. Even my humble GSO “tracks” fine by hand at 300x. Its motions are smooth and easy, and even novices will soon get the hang of following objects with a scope like Zelda. Yes, even a 10-inch Dobsonian can be a handful for some of us, especially as we grow older. If you’re observing in your backyard, however, you can minimize the amount of setting up and tearing down you have to do. If you have a reasonably secure yard, why not leave the telescope set up through stretches of clear weather? That’s what you'd do at a star party, so why not at home? A good cover like a Telegizmos one will keep your beloved telescope snug and safe from unexpected weather. Doing this is like having an observatory without the expense and hassle of actually putting up a dome or roll-off. Eyepieces: Even if you’ve only been in our avocation for a short time, you’ve probably already begun to accumulate a box full of oculars. Which are good ones for the backyard? As I've said many a time before, don’t scrimp on eyepieces. Buy the best you can afford. You'll be able to use them for the rest of your observing career. Good coatings and light transmission characteristics and build quality (a decent eye-cup is important if you have considerable ambient light to deal with in the backyard) are frankly even more important under the suburban sky than at a dark site. Getting a good eyepiece does not mean you have to spend a mint. I love my TeleVue Ethos eyepieces, which I bought not long after they were released. But if I had to do it over again, I would likley not spend the money they command. As you know, I'm cheap and to my eyes the considerably less expensive Explore Scientific 100-degree eyepieces are every bit as good. And the even less expensive Meade 100s pleased me a lot when I reviewed them for Sky & Telescope not long ago. Ethoses and other 80 - 100-degree jobs, are what your old Uncle favors? Yep. Especially if I'm using a Dobsonian without automated tracking. With a non-motorized telescope, keeping an object in view is much easier with a wide apparent field eyepiece. If you've got a wide field eyepiece, it's also sometimes possible to star hop using that eyepiece rather than a finder. That is particularly nice in areas like Virgo where there are few guide-stars visible in a 50mm finder. I can "eyepiece-hop" to those multitudinous galaxies. A top of the line eyepiece may be wonderful, but that doesn’t mean it’s wonderful all the time, including in compromised suburban skies. I’ve had a 27mm TeleVue Panoptic for years and will never part with it. It’s a classic from a master of eyepiece design. However, in the backyard, I find a much humbler ocular, a 2-inch Bresser 25mm I won at a star party last year, trumps it. Slightly more apparent field, slightly darker field. Would I trade the 27 for one? No way. But the more expensive eyepiece isn’t always better. Finding Objects: If you’re gonna see objects, you gotta find ‘em. The question is how to do that. Especially in the backyard where object finding is harder than anywhere else thanks to the bright skies and lack of stars to use as guideposts. Certainly you can use goto. I’ve been a big proponent of automatic object locating since I realized goto was practical, affordable, and reliable over twenty years ago. Goto makes finding things in star poor suburban skies simple. One big benefit? If you know your goto mount places objects in the field without fail, you may be able to spy a very marginal DSO by scanning that field intensely. Not sure if the object is in the field or not? You’re tempted to move on after a little looking. However, if, like me, a big part of backyard observing is “simple,” you may want to eschew batteries and cables and computers as I do with Zelda. What is effective for object locating in brighter skies? Not a zero power sight like Zelda’s Rigel Quick Finder, at least not by itself. There are not enough guide stars to allow you to pin an object down precisely without optical aid. That’s why I always use a 50mm finder in concert with the Rigel. I roughly position Zelda with the zero power sight, and then home in with the the finder scope and SkySafari. What sort of 50mm finder? I prefer a right angle-correct image ("RACI") finder like the one Zelda came equipped with. The finder has a star diagonal which means I only have to shift my eye a short distance from the main scope eyepiece to view through the finder—very convenient and comfortable. The finder’s special built in star diagonal presents an image that is both right side up and mirror correct. So, then you star hop. You look at your charts and draw imaginary lines and shapes to find your object: “M57 is halfway along a line between those two stars”…"M15 makes a shallow triangle with those bright stars" and so on and so forth. One tip? I find that if I can’t locate an object after several tries, it means I’m not just slightly off from its position in the sky, but way off. I further note it’s pretty easy to get out of practice with star hopping. If I haven’t done any in some months, it may take an evening or two to get back in the swim of things. Knowing that, I don’t get frustrated (“Why can’t I even find M37? I’m going back inside!”). I keep going and it all eventually comes flowing back. Finally, don’t discount star hopping as fun in and of itself. Especially in suburban skies were the objects themselves don’t always look that great. The hunt is its own reward and sometimes that is enough. Averted vision: The light receptors toward the edge of the retina, the rods, are more sensitive than those near the center, the cones. So, if you’re observing an even marginally dim DSO, look “away” from it rather than directly at it to see the dimmest details. Which eye? If you’re right handed, your right eye is likely the "dominant" one. If you’re left handed, vice-versa. Usually the dominant eye is better for deep sky observing, but experiment with the opposite eye as well. Shake it! The eye-brain combo has an easier time registering moving objects, so sometimes a tap on the telescope tube will cause a challengingly dim DSO to appear as if by magic. You can see a lot more if your eyes are as dark adapted as they can be. In the suburbs, what usually prevents that is not so much the general light pollution, but ambient light. Turn off nearby lights and shield your scope and yourself from those you can’t turn off. 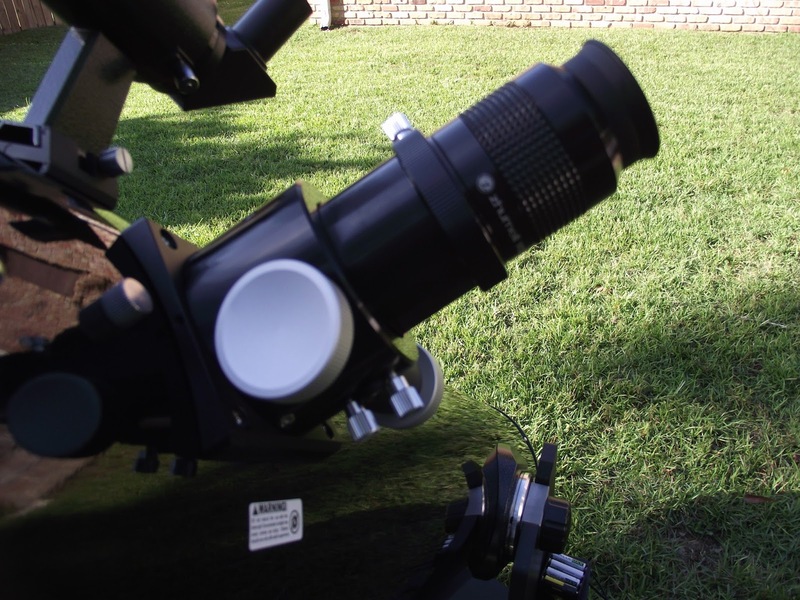 Most amateur astronomers tend to use too little magnification on objects rather than too much. In the suburbs, more power darkens the background sky and increases contrast between it and the object of your desire. Growing older. Alas, it happens to the best of us, even me. Being aware of the changes you’re experiencing or will experience will help you deal with them. Your eyes’ corneas are probably beginning to yellow for starters. That can be good and bad. Bluer objects won’t be as bright, but if you, like me, are a fan of achromatic refractors, you’ll find the color purple has been much reduced. Your eyes now have built-in yellow filters and it’s as if your fast achromat has suddenly become an APO. Eventually, if you progress to cataracts, your eye doctor will say it’s time for the big fix, surgery. That will both return the stars to their accustomed brightness and turn your "APO" back into an achromat. You may develop increased sensitivity to cold. I was pretty OK in this regard all through my 40s and well into my 50s. In my 60s, I find I get colder more quickly and can’t ignore that as easily as I once could. When my feet get cold, I know it’s time to quit. There is a big plus for backyard observing in this regard: When my feetsies get cold I can take a break inside and go back for more when I warm up. Feeling creaky. Except for my (self-imposed) back problems, I’m pretty good here. The time will come for all of us, however, when it’s harder to contort the old bod to do things like look through straight-through finders. Luckily, there are work-arounds like the above-mentioned RACI finder. Did you know you can even get a right-angle adapter for a Telrad sight? Weight can become a problem as we age. Make that will become a problem. That’s no reason to stop observing, however. Even if you have to drop down a couple of aperture notches, some telescope is better than no telescope. Also, modern designs like ultralight Dobs mean many of us are going to be able to carry on with at least as much horsepower as we used in middle age. The backyard is a big win here, since you can do things like wheel the scope out of and into a garage on a set of "wheely bars," etc., instead of having to carry the instrument to and from a vehicle. Some of the older observers I know are beginning to go inactive due to a fear of falling in the dark. If you are in your 70s or 80s, there’s no doubt falls can be dangerous. 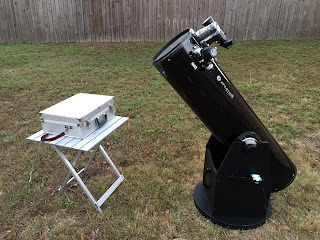 In the backyard, however, you can do things like position small red lights on the ground to show the way, mark the scope and observing table with more red lights, and turn on white light when needed. In the backyard, you’re at least very familiar with your surroundings, too. So, I've given up dark site observing? No. Not quite. I’ll go to a dark site when I’m chasing the dimmest of the dim, or want the best astrophotos I can get. But otherwise, it’s the friendly and comfortable back 40 for me these days. You can’t expect every star party to be great. Sometimes, often through no fault of the event itself or its organizers, things just don’t quite pan out for you. So it was for me with the 2017 edition of one of amateur astronomy’s longest running events, the Deep South Star Gaze. I suppose part of the problem was that I just wasn’t as excited about the year’s DSSG (née “Deep South Regional Star Gaze”) as I used to be. Which doesn’t have a thing to do with the DSSG. It has a lot to do with where I live now. Out here in the suburbs, I have a zenith limiting magnitude of about 5 on a good night, far, far better than I had downtown at old Chaos Manor South. I can observe and even image profitably from the backyard. Sky gonna be clear for two-three-four-five nights? I can leave my telescope set up in my secure yard just like I do at a star party. Even given the current nasty weather pattern, I can sometimes get 7 – 10 nice nights per month out here in Hickory Ridge, nights with no or minimal Moon. So, there’s just not the level of anticipation there was when I might, if I were very lucky, get one clear night every month or two that coincided with a club dark site observing session. Back then, a week or so at a star party was just heaven. How I longed for those deep sky photons after being deprived of them for months. My current mindset also has to do with work—or the lack of it. I am now what they call “semi-retired.” While I continue to teach one day (and night) a week for the Physics Department at the University of South Alabama, and am a Contributing Editor at Sky & Telescope, it’s not like I’m snowed under. When I was still doing my engineering gig, commuting at least a couple of hours a day (and working plenty of hours during that day), a star party wasn’t just an opportunity to observe; it was a much-needed vacation. At first, it was wonderful to be free of the rat race. I remember Saturday afternoon at the Deep South Spring Scrimmage in 2013, the year I retired at age 59, thinking maybe I’d better go ahead and pack some of the astro-junk in preparation for an early departure Sunday a.m. “Wait a minute. I can leave as late as I want Sunday. I don’t HAVE to go to work Monday!” That was great for the first couple of years, but by 2015, a trip to an astronomy event began to have slightly less appeal than it did in the years when I really needed a break. That’s where I stood as the October new Moon and DSSG 2017 approached. I wanted to be back on the Feliciana observing field, hanging out with old friends and doing some astronomy from a nice and (amazingly) dark site, sure, but I wasn’t as crazy for it as I used to be. “The longest journey begins with a single…” yadda-yadda-yadda. My first step was loading the 4Runner, Miss Lucille Van Pelt, with the gear we’d need for four full days at the Feliciana Retreat Center in the wilds of the Louisiana piney woods. In recent times, we’ve tended to do three full days, but we thought doing Wednesday through Sunday morning instead of Thursday through Sunday morning might give us a better chance of getting in at least one good night if the weather turned bad, as it can down here in mid-October—DSSG would be early this year thanks to the New Moon date. As the month wore on and the star party approached, it looked like poor weather was exactly what might happen. When the week of the event finally arrived, the prognostications on wunderground.com showed happy little Suns and Moons for Tuesday and Wednesday, but after that it was partly cloudy days and nights, and, by Saturday, lightning studded thunderstorm clouds. In fact, the weather forecast for Saturday night began to sound dire. Anyhow, I’ve been to so many star parties over the last twenty years that packing for one is second nature. I know where everything should go in the truck, and, most importantly, what should go in. I make sure nothing gets left behind by relying on checklists I’ve refined and revised over the years. Nothing gets checked off till I physically place it in the 4Runner. It was all pretty standard stuff, but with a couple of changes: a new mount, a Losmandy, and a new telescope, a 115mm APO. If you’re a faithful reader, you know I recently sold two of my beloved Synta mounts, the Atlas and the CGEM. I still have my AVX, but what would travel to the star party with me would be my new GM811G. While I’d been able to try the Losmandy out in the backyard, the cloudy early fall weather prevented me from giving it a good shakedown cruise, and I was looking forward to finally doing that. Thanks to its design, the GM811 and its tripod actually took up less room in the truck than the CGEM had, despite the Losmandy’s substantially higher payload capacity. New telescope? No, I didn’t go out and buy yet another refractor. The star party would be more than just a pleasure trip for me this year. That APO, a loaner from Meade, would be the subject of my next Sky & Telescope Test Report. That was another reason Dorothy and I’d decided on a Wednesday rather than Thursday departure. That would allow me more time to put the scope through its paces. Once Miss Van P. was loaded, I sat back and relaxed with a little Tuesday night TV. There was really nothing more I needed to do to prepare for Deep South. I hadn’t been asked to give a presentation this year, so I didn’t have to spend time reviewing and agonizing over a PowerPoint. The drive to the Feliciana Retreat Center near Norwood, Louisiana was a relaxed and uneventful one when we finally got going. There wasn’t much reason to start the three-and-a-half-hour drive too early. With DSSG taking place with DST still in effect, we’d have plenty of time to set up before sundown. We settled on 11:30 or so as our hit-the-road time. That would allow me to pick up the new books from my Local Comic Shop (Wednesday is New Comic Book day, of course), Port City Comics. and eat Chinese afterwards, as I always do on Wednesdays. After a little more than three hours on Interstates 10, 12, 55, and multiple Louisiana back-roads, we were rolling onto the Feliciana Retreat Center grounds. We headed for the field straight away to stake out a spot. 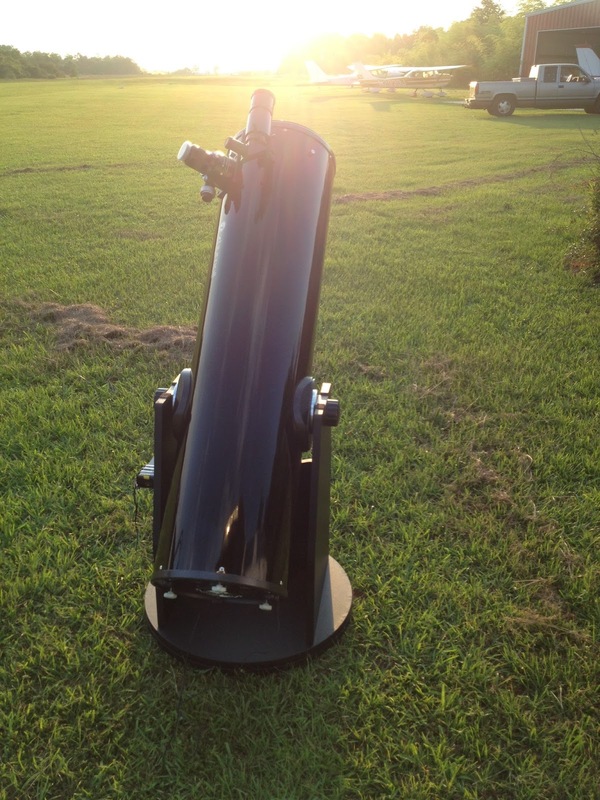 The weather had been good Tuesday night, and looked to be even better Wednesday, so it wasn’t much of a surprise that there were already plenty of eager amateur astronomers on the field. My usual place along the eastern side was taken, so I picked one on the northeastern field edge. The view to the south was compromised by a tree, but the light dome in that direction meant I wouldn’t be giving up much. Setup done, Dorothy and I drove to the lodge to unpack in our small motel-like room. I noted with approval that the FRC had done some maintenance and remodeling, and that our room looked cleaner than the one we had the previous year. Thence back to the field for the door prize drawing. No, we didn’t win a thing, but we’ve won (or at least Dorothy’s won) plenty over the years. Drawing done, I did the final preparations for the coming evening’s observing run, and we returned to the Lodge for dinner. When you’re at a star party with not much to do during the day, food often assumes a more than normal importance. Especially when, as at DSSG, there’s no nearby town with decent restaurant alternatives and other diversions. One thing that had always been good, very good, at the FRC was the meals. Oh, there was one year when the portions were a little skimpy, but the food that was served was high in quality. Not this year. The food was, to put it plainly, terrible. Start with dinner. Tiny pieces of chicken that were as dry as the Sahara. The next morning at breakfast, I finally identified the yellow disk that was plopped onto my plate as eggs. The plastic-like thing did taste faintly of eggs, anyway. One evening there was jambalaya that tasted like it came straight out of a can, and was accompanied by a side of canned corn. Another “memorable” meal? Salisbury steak that was apparently made the same way MacDonald’s makes chicken nuggets: smash some powdered something together in a mold. I expected better based on past experience, and knew the Feliciana Retreat Center could have done better if they’d wanted to. I survived largely thanks to the salad bar (which also wasn't what it used to be). While the food was reasonably priced, they weren’t exactly giving it away, and it was certainly not a good value. I am aware the FRC has had its share of financial problems and needs to economize, but this is not the way to do it. Anyway, I would have gladly paid five dollars more a meal for good food, and I suspect other star partiers would have as well. Dinner, such as it was, concluded, what was the plan for Wednesday night? Astrophotography. I don’t generally like to jump into picture taking on the first evening when I’m tired from the drive and set up, but the weatherman was beginning to suggest that if I were to get any pictures, I’d have to get them Wednesday night. How was aligning the GM811? Polar alignment was exactly the same as what I’d been doing with my Chinese mounts for the last six months or so, polar alignment with the PC program Sharpcap using my guide scope and guide camera. The difference was that the much more precise altitude and azimuth adjusters on the Losmandy made it far easier to get a dead-on alignment. Goto alignment was similarly easy. Using the mount’s Gemini 2 hand control, I centered three stars in the west, where I’d be doing most of my imaging, and one star in the east. While you can build multi- star models on both sides of the Meridian, my experimenting in the backyard had shown that four stars total was more than enough for the mount to yield excellent pointing accuracy. OK. Fired up the laptop, connected to the mount over the Ethernet cable, started my camera control program, Nebulosity, and guiding program, PHD2, and was ready for picture-taking. What first? Well, how about good, old M13? 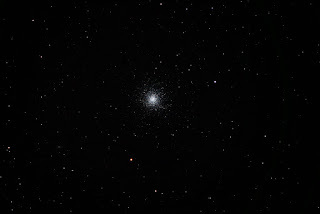 I clicked on M13 in Stellarium and the mount headed to the Great Globular, stopping with it centered in the frame of my DSLR, which was displayed on the laptop thanks to Nebulosity. I focused using my Bahtinov mask and Neb’s fine focus routine, and began a series of 300-second exposures. Unfortunately, when the first one finished, I could tell I had big problems. For some reason, the images were in black and white. The program appeared to be debayering them, since they looked normal rather than having the pixilated appearance of non-debayered shots, but they were in black and white and nothing I tried changed that. OK. I’d work on the computer in the morning (images were normal with the DSLR itself, but I didn’t have a cable release/intervalometer, so I couldn’t use it for long exposures without the laptop). For tonight, I’d just give the refractor a visual workout and spend some time getting more comfortable with the new mount. How did the Meade 115mm APO do? To find out, look for my Test Report in an upcoming issue of S&T. I will say it surprised me. After a while, I forgot I was using a telescope with "only" 115mm of aperture and just enjoyed the beauties of the deep sky it showed me. As for the GM811, it never faltered. Gotos were dead on in the west; in the east it placed objects in a widefield eyepiece despite me only having aligned on one star on that side of the Meridian. I hung in till about midnight—my usual turn-into-a-pumpkin hour in these latter days, I must admit—before parking the mount and walking back to the Lodge to get some shuteye. After eating what I could of breakfast the next morning, it was time to troubleshoot the laptop/Nebulosity problem. Sitting in the dining room after breakfast with the PC and camera, I made absolutely no progress. The problem persisted. All the images were monochrome. I was pretty sure uninstalling and reinstalling Nebulosity and the camera drivers would fix things, but that wasn’t possible. The Internet was so slow at FRC this year that my laptop would barely even connect to it. So, no pictures Thursday, either. It didn’t look like the evening would be imaging worthy anyway. Stepping outside the Lodge and looking up revealed a sky blighted by high cirrus and even a few “mare’s tails.” If the camera had been working properly, I’d no doubt have tried some shots Thursday night, but it wasn’t, so it would be another visual evening. In the afternoon, it was prize drawing time. Again, we didn’t win a thing. Well, Dorothy would have won a nice TeleVue eyepiece if she’d been on the field for the drawing, but she wasn’t. The drawing’s time was different from what we thought it would be—I was only present because I happened to be on the field fiddling with my gear. Unlike in past years, “must be present to win” meant, “not just at the star party, but on the field.” Unfortunately, we rarely knew when a drawing—or anything else—would take place. No schedule was posted anywhere that I could find, so Dorothy and I were in the dark about “when and where” much of the time. Other than that, it was a nice afternoon spent getting reacquainted with many old friends. Maybe the best thing about this year’s event was hanging with the people I see too seldom, including Charles Genovese, Walter Serrat, Walt Cooney, Barry Simon, Dave Diaz, Ron Marcella, Greg Thompson, Bryan Shirkey, and many more (I did note a couple of familiar faces were missing, perhaps thanks to the worsening weather forecast). Also onsite was Scott Roberts, who I’d last seen ten or twelve years before when we’d both been guests at one of Herb York’s old Optics Expo shindigs in Anacortes (Washington). As you probably know, after years at Meade, Scott was chosen to helm the new Explore Scientific. Not only did Scott do a presentation at Deep South this year, he donated many of his wonderful eyepieces and an APO refractor as prizes. Finally, it was sky watching time Thursday night. I unparked the mount and was ready to go immediately, no alignment required. Conditions were not horrible early on, just not good. Those cirrus clouds were making their presence felt, and it was obvious the sky was slowly going south. I had a lot of fun touring the early winter open clusters, but by midnight even NGC 457, the bright E.T. Cluster, was fading away, and I gave up. The dew had been incredibly heavy, and I was damp from head to foot and uncomfortable after spending a night at the eyepiece out in the open instead of sitting at the computer under a tent canopy as I’d intended. Friday afternoon, the weather forecasts we were pulling up on our smartphones (when we could do that given the state of the Center’s Internet) indicated “severe” was not too strong a word for what would happen Saturday night. Dorothy and I decided we’d leave on Saturday morning. Why sit and watch it rain in the FRC Lodge when we could do the same thing at home in comfort? To that end, I packed the tent canopy and most of the other gear Friday afternoon. Even if it didn’t rain Friday night, the dew would again be heavy, I was sure, and nothing is more miserable than packing wet gear. I left the scope up just in case, but that was it. Friday night, I wandered out to the field a couple of times, mainly just to shoot the breeze with various and sundry fellow observers. There may have been a few sucker holes over the course of the evening, but not many. I’d covered my scope and mount at sundown, and left them that way. I whiled away the night watching movies in the lodge. In retrospect, we made a good decision. The weather Saturday night was indeed severe. Apparently, the FRC actually lost power briefly Sunday morning, something that’s never happened before despite some fierce storms here and there over the years. Absolutely no viewing Saturday night, of course. Will I be back for DSSG 2018 next year? I plan to be and would like to be. I’ve missed a grand total of one Deep South since 1992, and it’s unlikely I will quit now. And I feel in my gut that 2018 will be a better year for moi. I hope that turns out to be the case, but who am I kidding, anyway? Long ago, Barry Simon told me, “Look, you know we’ll all keep returning to Deep South like swallows to Capistrano as long as we are able.” I hope to do just that. Reinstalling Nebulosity and the Canon driver once we got home did indeed fix my problem, whatever it was. Murphy banished and the weather finally looking up, I find myself eager to do astrophotography from my backyard. In fact, I'm sanguine enough about observing again that I'm kind of looking forward to next year's Spring Scrimmage. PLEASE, NO MORE OF THAT JAMBALAYA, though! Yes, this is a rather recent entry to be a "greatest hits" article. But there is a reason for that. The DSRSG has been on my mind a lot several weeks--I'll always think of the event as the Deep South REGIONAL Star Gaze, its name during its glory years, which ran from it's inception in the mid-80s all the way to 2005. When I wrote this article, I was a bit letdown that 2017 had been one of the star party's poorer years. I just didn't have as good a time as I usually do. However, I would undoubtedly have enjoyed it more or at least tried to enjoy it more if I'd known 2017 was possibly the DSRSG's last bow, its swan song--at least for me. What happened? It has been obvious for a couple of years that the Feliciana Retreat Center has been suffering serious financial difficulties. Unfortunately, it seems the owner of the facility, the Presbyterian Church, has made a wrong-headed decision as to how to keep the place afloat. During tough financial times, the easy and tempting answer is to cut expenses to the bone. Which is what has been happening at FRC. The site's (competent) employees were let go and replaced with part-timers who appear to have gotten in way over their heads. The result? Same old story you've seen a hundred times. Save a little money by reducing costs, quality suffers badly, customers notice and desert you in droves, and the business doesn't just fail, it crashes. If I thought things were bad in the fall, I didn't know what "bad" was. Despite, as in the above Postscript, me looking forward to the spring version of DSRSG, in the end I declined to participate, having at least a suspicion of how things might go. It appears those suspicions were justified--I've had a full report from Barry Simon, the DSRSG's long-time Director, and what he told me is hardly encouraging. So what is the future of DSRSG? Barry is looking for a new site, but, as he told me, if a suitable one, one at least comparable to FRC, doesn't turn up, maybe it's time to accept this is the end. 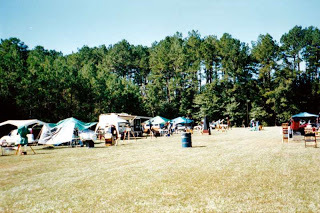 The event was remarkably stable all through the 1980s and 1990s when it was held at Percy Quin State Park in Mississippi. Following the growth of light pollution in the McComb, Mississippi area (and other factors) the DSRSG has been moved twice in this new century. Frankly, I'm not totally sure I am interested in starting over with yet another "new" DSRSG. As I have said before, when autumn comes in, it might be a completely different story. Whether the event is held (if it is held) at a new site or at an improved Feliciana Retreat Center, I just might get Deep South Fever again. But you know what? I doubt that at this point, in July. For me, the star party was never quite what it once was after we left Percy Quin. Oh, there've been some fun years, but never quite as much fun (for me) as in the 1990s. Right now, I think I'll be happier just calling it quits and finding something else to do in the fall. I really don't want to spoil my wonderful memories of DSRSG with more "bad years." However it turns out and whatever I decide, there is one thing I know for sure about DSRSG: What fun we had! For years and years! Maybe that is enough.